The North Carolina Arboretum has a new quilt exhibit in the upstairs gallery of the Education Center. Nature Across the Carolinas showcases the work of three leading fiber artists, Judy Simmons, Mary Stori and Kate Weston, who use fabrics and fibers to showcase the mountains, meadows and marshes found across North and South Carolina. On display daily through September 16, 2018, from 9 a.m. to 5 p.m., this exhibit uses quilted wall art to link familiar images of the region using diverse styles and construction methods. From large focal-point wall hangings to medium-sized wall art to small pieces suitable for tabletop display, Nature Across the Carolinas adds a contemporary twist to the area’s rich and storied quilt-making tradition. 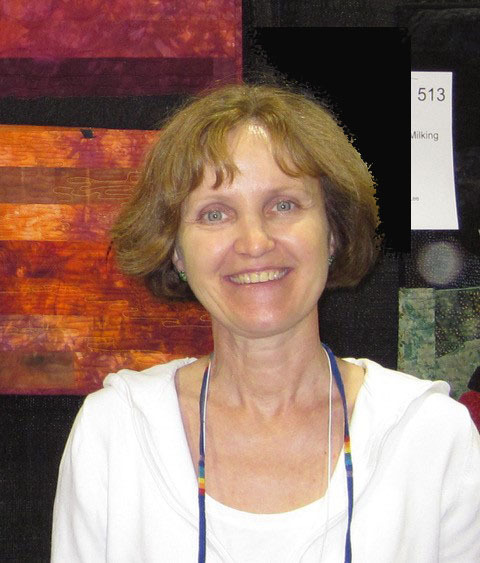 I recently had a chance to catch up with one of the artists, Kate Weston, to learn more about the exhibit and the group’s unique quilting style. 1.) 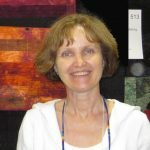 What makes your quilting methods different than traditional techniques? Many of our pieces utilize traditional techniques in piecing, appliqué and quilting. What often may be different are the materials we use. There are so many ways to apply dyes, paints, inks, oil pastels, plants and other materials to produce colors and images on fiber and fabric. We enjoy creating our own custom fibers and fabrics, which are usually very different than those available commercially. We also enjoy creating designs from our own inspirations. 2.) How did the three of you connect? Mary, Judy and I belong to two local groups, Professional Textile Artists (PTA) and Fiber Junkies. We also share an interest in exploring the use of mixed media with fiber. 3.) What advice would you give someone interested in learning how to quilt? It is a great idea to start by taking some classes at a local quilt/sewing shop. I would also recommend joining a quilting guild in your area. It is a great opportunity to meet other people who share your interest, and the guilds usually offer programs, lectures and workshops throughout the year. 4.) What makes this exhibit unique? Each of us has a different artistic style that really complements one another. We enjoy arranging the pieces on the walls based on how pieces look together rather than by the artist. This way, it provides a lot more interest to the viewer. 5.) Why did you decide to focus on nature with your pieces? Natureis life. The array of colors, shapes and textures found in nature is such a wonderful source of inspiration for us. 6.) Anything else that you’d like to share? We hope you will also visit our blogs and websites to see more about our methods, techniques and sources of inspiration. Nature Across the Carolinas is on display daily through September 16, 2018, from 9 a.m. to 5 p.m. inside the Education Center. All pieces are available for purchase, and a portion of the proceeds will be donated to The North Carolina Arboretum Society. For more information, please click here.